2002 outback 2,5l. cooling fans on radiator running much more often after radiator replaced. Even when not hot outside or AC/defrost not turned on. Temperature today was 45 with moderate speeds while driving. Seemed like the fans were cycling on much more often than past, Coolant level was full. Air purged from coolant system day before. Thermostat 1 year old. Could it be the engine coolant temperature switch sensor is bad ? Temperature gauge is registering where it usually does, middle of gauge, when operating temp. is reached. Not losing fluid. Oil level good. There was a lot of air left in the cooling system when the radiator was replaced but like I said I purged the remaining air as soon as I noticed it. So I would not think it could be from air in the system. What brand thermostat do you have in the engine? There have been many cases where an aftermarket thermostat starts restricting flow. It happened to me. The other thing to confirm is if you have your ECU in test mode like you would have for tuning, it cycles the cooling fans every few seconds whenever the key is on. The thermostat was replaced about a year ago and no change until now. I disconnected the battery the day before. Used the code saver in the outlet, but did not have the ignition switch in the right position so it did not work. Have disconnected battery before with no problems. Maybe something was damaged or changed when the radiator was replaced. I did not replace the radiator myself but the person who replaced it has a good track record and works almost exclusively on subarus. Only three things have changed before the problem (1) radiator replaced (2) battery disconnected (3) a lot of air in coolant after radiator replaced before I purged the rest of it out. The fans are switched by the car's computer which turns them on and off based on the temperature sensor. There is no temperature switch. The conditions for turning the fans on at low speed/high speed or off are on page CO(HS04)-3 of the service manual. It's a pretty complicated table that ratchet's up the fan speed from off to low to high and back down based on whether the coolant temperature is going up or down and whether you are accelerating or decelerating. In a nutshell, during warmup, the fans should turn on to low speed at about 205F, then go to high speed at around 212F. When driving at higher speeds, the fans will go to low speed or turn off in the mid temperature range because the computer knows that road speed is forcing air through the radiator and the fans don't need to do the job. 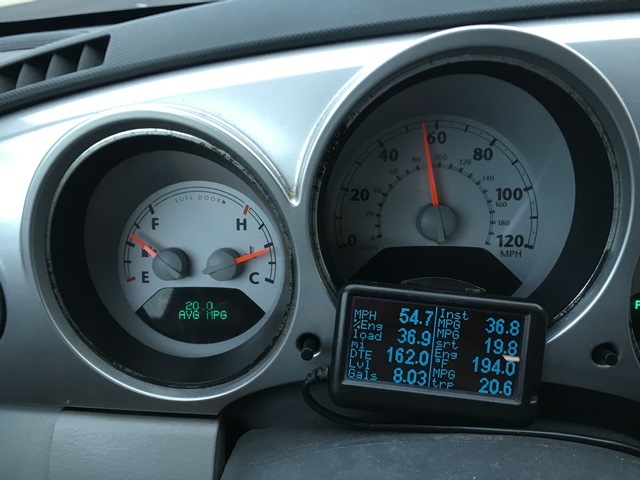 By looking at the temperature numbers, you get a much better idea of what's happening to the coolant temperature than the analog gauge which is terribly compressed around 180-210 degrees. This is intentionally done so the driver won't be alarmed when the coolant temp goes up and down as the thermostat opens and closes and the fans turn on and off. This is the normal operating temp of most engines and so long as the temperature stays in this region, you are safe. If you are concerned about the cooling system health, it would be a good idea to get an OBD2 scanner. If you don't already have a hand held OBD2 scanner that you can run in your car during normal driving, one of the least expensive ways of doing this is to get an ELM327 based Wifi or Bluetooth OBD2 adapter and use a free app on your phone. 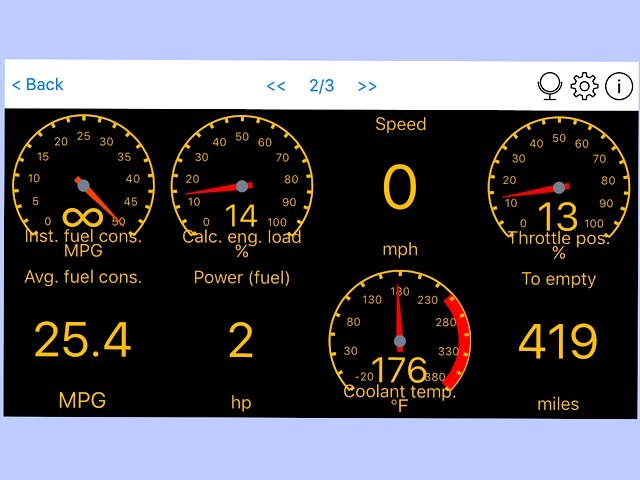 Look at the app store of your choice and you'll see some free apps that work with OBD2 adapters and virtually all will display coolant temperature for free forever. Other features may be locked or expire until you pay. Another useful full time display is the UltraGauge. It's a wired plug in gauge for $80. Highly recommended for drivers who want to see more about what's going on in their car but don't have a spare phone to dedicate for OBD monitring. Thanks for the info. Think I will look into buying the ELM327 wifi for Android or the UltraGauge . Today when I drove the cooling fans did not cycle through as often as yesterday ??? even though the temperature was 25 degrees warmer than yesterday ? will keep an eye on it though and see what the scan tools indicate. Yea, If the problem continues or the scan tool shows some numbers out of wack then I will look at replacing the thermostat but what was supposed to be a good quality thermostat was installed last year when the head gaskets were replaced. But you never know for sure. The one that was there before the head gaskets were replaced was not in good shape. Yes, when I checked them yesterday they were both running when they cycled on. And I think they were on the high speed, But not sure. Today they are not cycling on nearly as much even though 25 degrees warmer ?? ?